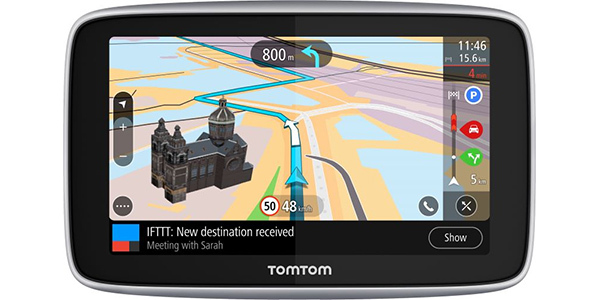 TomTom has announced their latest and most feature-rich TomTom to date - the GO Premium. The main new feature of the device is the inclusion of IFTTT (If This, Then That) to allow control of smart home devices - such as opening your garage door as you arrive home, turning the lights off when you leave or turning up your Nest thermostat as you set off home from work. IFTTT is a highly customisable service that, in recent months and years, has added more and more support for smart homes and can control various actions on Google Home, Amazon Echo and Apple Home Kit as well as services like Phillips Hue and more. Other regular features that the average person is more likely to make use of include built in Wi-Fi (so you can update the maps and software without needing to connect to a computer), sharing your location and ETA with your phone contacts (Android only) as well as linking to the MyDrive phone app to give you walking direction to your final destination and saving you parking location. TomTom has also recently celebrated selling over 100 million navigation products and are also releasing a brushed-gold finish version of the GO Premium called the GO Premium X although this will set you back an extra £70... RRP of the Go Premium is £299 and are available to purchase now from the TomTom Online store. But why are they still peddling devices with those stupidly big bezels? have they put back al the missing features, I think not. At the risk of sounding censorial, do any of us actually believe this? I mean, my first reaction was B*******. I can think of several features which enriched my GO520 (2005), RIP. Just think, a remote control for today's deep windscreens would be a rich feature. And God knows how many others we can all list. Brushed gold finish - Oh my life, what an attraction. And at that price, most of us could afford two or even three. Oh the bling!! I have a TT930 with remote, the reason I refuse to upgrade is I don't want to sacrifice the remote. I don't understand why TT did away with the most useful feature of the lot. "TomTom has announced their latest and most feature-rich TomTom to date"... I very much doubt it! I go all over Europe and I’ve found my old GO 910’s almost perfect for the job (the mount design however is not good). When TomTom released the GO 940 LIVE back in 2009 they hit the nail on the head... what a product! But now almost everyone has a smart phone and can use Google Maps for free to get from A to B... so why do they still produce featureless comparable products? TomTom’s own Android offerings so far have been awful. TomTom need to step back and rediscover what users of these devices really require. They’ve already done the hard work over the years so why reinvent the wheel... revamp the code and port it to new snazzy devices. They ported Navcore 7.910 perfectly to Windows CE years ago which I still have running perfectly on an old Win CE device... I wonder if April will cause these devices problems? If April spells the death of my 910’s I’ll be looking to Garmin or Sygic as TomTom have nothing to offer me. I assume this device still does not have 'warn when approaching a poi', so the pgpsw speed camera data base will not work. When my TT 1005 live dies, I will be voting with my cash to buy a Garmin. Get a grip, Tomtom, and provide the features people want! What they don't tell you is the EOL is next thursday ..... going by their recent decisions ... wouldn't trust them as far as I could throw them. It was probably planned by TomTom not to patch older systems many, many years ago so next Wednesday would be the mass death of their older devices... and a big boost in their sales (or so they think). The thing is when you go out, just say heroically to those you leave behind “I may be some time”. The feature I miss the most on my GO5200 is the ability to plan, very simply, a route itinerary. I found this invaluable, particularly when towing.